What’s your facial cocktail looking like? A dropper full of serum? A dollop of lotion? JENNIFER: After cleansing and toning, I apply three drops of Herbivore Botanicals’ Purify serum. It has a very punchy scent – it took me a while to get used to it! – but it works wonders on oily skin. It seems to moisturize from the inside out without leaving an oily residue on the surface. It’s a very “un-oily” facial oil, if you will! After that I’ll layer on Kimberly Sayer’s Ultra Light Facial Moisturizer in SPF 30 for daytime, and then Skincado’s thick, wonderfully moisturizing eye balm. For any dry spots, I dab on Osmia’s Purely Simple Face Cream or Pai Skincare’s Avocado and Jojoba Hydrating Day Cream. 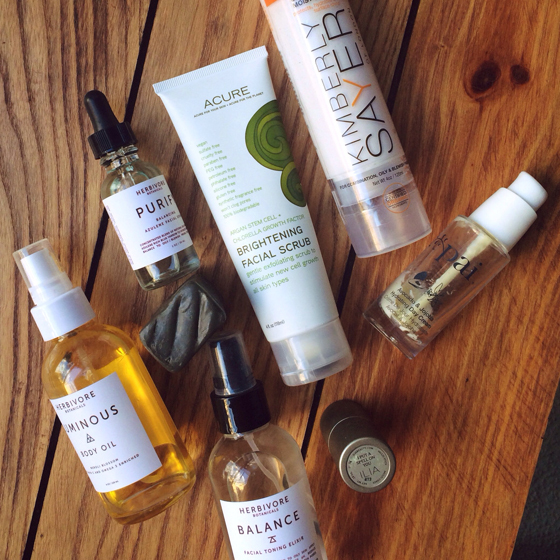 KATHRYNE: Here is where my facial regime gets complicated, as I am always trying out new products for the blog. It’s a like a smorgasbord most weeks! I like to use Peter Thomas Roth’s Squalene Oil on days when I’m working from home (no make up). It’s light and absorbs really nicely and does wonders for fine lines. On days I know I will have to put on make up, I will wear a lotion like Acure’s Sensitive Facial Cream. It works well under make-up. Often, I will shower in the evening and douse my skin in an oil like coconut or argan. When I wake up the next day, my skin is supple and not oily (but well moisturized) and then I will just put make up over that and it’s perfect! Read the full Q&A over on Edible Facial. Endless thanks to Sarita for featuring us, and for her positive and energizing spirit! Next Article Wild About Pemberley Jones! Alima Pure and Weleda For The Win! Great post! Always good to see what others are currently using I love the Osmia Black Clay Soap! I’m so hooked on your blog! After years of proactive and less-than-natural beauty products, I was inspired by your blog to change my ways. I love your product reviews (just received my first haul from #pemjo and herbivore botanicals and LOVING everything I got). I’ve learned a ton from your reviews and have started paying attention to ingredients on the labels while shopping in the store, and immediately noticed that many products that brand themselves as natural/green are anything but. Wondering if you’ve done (or would consider doing) a more general post on what sorts of ingredients to avoid? Greenwashing is a really frustrating phenomenon. That’s why you’re right – reading the ingredients lists is SO important! We will absolutely look into doing a post along these lines – it’s long overdue – thank you for the idea/feedback! In the meantime, here are some good resources that should be of help.